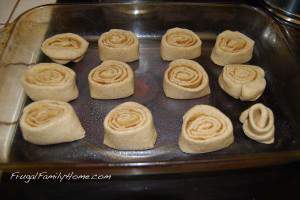 Today’s cooking for the freezer is another breakfast item, cinnamon rolls. I am not sure how long these will be in the freezer as we all like them very well. 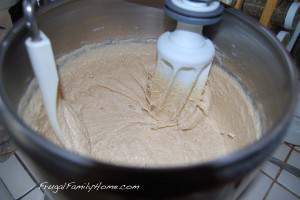 I don’t have a bread machine so I mixed these up in my mixer like I did yesterday for my bagels for the freezer. Today I was out of the house for a while with my mother-in-law so I decided to make these cinnamon rolls with a quick recipe. 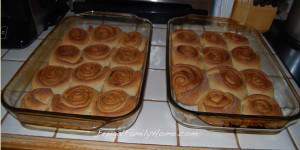 I used the 90 minute roll recipe from Dining on a Dime cookbook for these cinnamon rolls but any roll recipe would work. I did change the recipe to be half whole wheat flour. 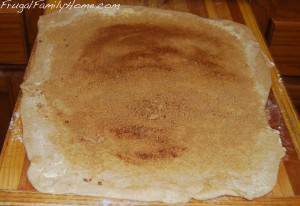 Once the dough was all mixed up I put it into the oven to rise for about 15 minutes while I worked with the kids. Then I rolled the dough out, spread the margarine on it and then sprinkled it with cinnamon and suagar. Then I just rolled them up and cut them. Placed them into my greased 9×13 pan. Then it was back into the warm oven to rise again about 20 minutes. Once they looked twice their original size I just turned on the oven and baked them about 30 minutes. I went ahead and frosted half of them. I think next time I might wait until they are coming out of the freezer to frost them as they might get messy when they thaw. I wrapped them up in groups of 6 in waxed paper and then in plastic wrap. After that I slid them into a freezer bag. I did keep some out for us to eat too. What kind of freezer cooking did you do today? They are good. We ate some tonight. I don’t know how long they will stay in the freezer though. I love having cinnamon rolls in the freezer. I usually don’t even bake them. After rolling them out and placing in the pan, I put them right in the freezer. You can then pull them out the night before and they will rise as they thaw. I also freeze the frosting in little baggies and put them with them to go on the warm rolls. 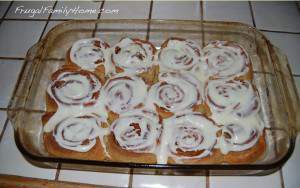 It is great having some items like cinnamon rolls in the freezer it makes making breakfast so fast and easy. Next time I will try freezing them without baking them first. Great idea of freezing the frosting too. 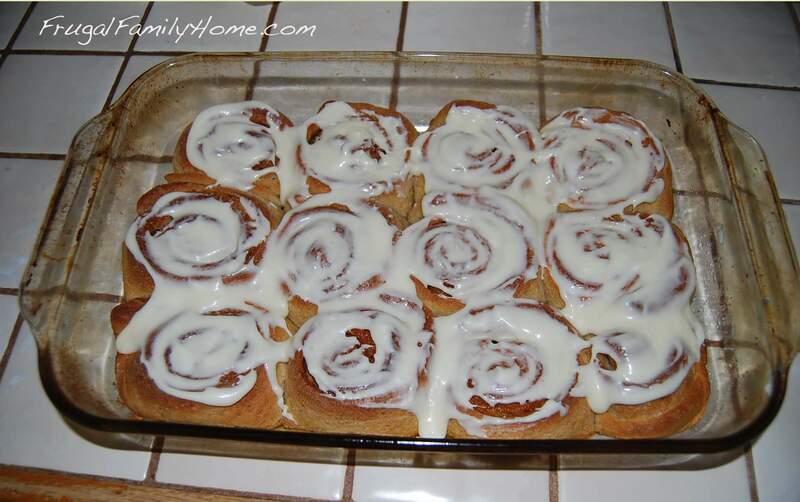 Here’s how I reheat the cinnamon rolls from the freezer. Usually I will take them out of the freezer the night before I need them and place them into the refrigerator still wrapped to thaw. Then when I’m ready to serve. I will unwrap the rolls and heat them up a little in the microwave to make them warm and yummy. If I’m in a hurry for a cinnamon roll or I forgot to take them out of the freezer the night before. I will place the frozen rolls on a place and microwave them on half power for 1-2 minutes and then check to see how thawed they are. Then heat at half power for another minute or two. Until the rolls are thawed and warm. I hope this answers your question. Let me know if you have anymore. I’m here to help!